I could’ve not existed. When I was young I almost drowned in a river. It was winter, lots of water and I went into the river with some friends. And the river pulls me over, pulls me over, and a cadet saves me. I was already a cadet. And another young cadet, a much better swimmer, reached me, grabbed my foot and saved me. Without him, I would’ve drowned when I was 18. [We should] ask more exciting questions. Hugo Chávez is always embellishing the truth, and the story of him almost drowning might be another exaggeration. But the fact is that, since his first dramatic entrance in Venezuela’s history in 1992, we can pinpoint several moments that are ideal for asking those exciting questions Ferguson refers to. 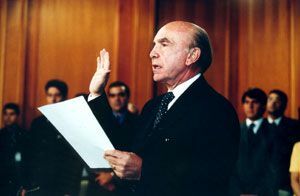 What would have happened in April 2002, for example, if Pedro Carmona had not dissolved Congress, the Supreme Court and other powers, and, instead of sidelining Vásquez Velasco, had named him Minister of Defense of the transition government? How different would history be had Carmona not taken those decisions that many people advised him not to take and that he could have easily not taken? How would we commemorate the anniversary of April 11th then? Roth and Ferguson are right. The history we learn in school is a more or less rational and coherent concoction that boils down to a predictable and logical sequence what, in fact, was a chaotic and arbitrary mix of plans, intrigues, accidents, coincidences and multiple interests that clash with each other provoking changes, misfortunes, advances and setbacks that are far more captivating than the illusion of inevitability that seeps out from schoolbooks.